Aha! Told ya it was a killer workout. You probably burned off like five gazillion-kajillion calories...at least. How cool Cher!!!!!!!!!! All that walking sure is a workout! I loved the pics & how you did that! I am so computer stupid! 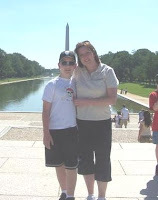 I went to DC for my 8th grade trip back in the dark ages!!!! I lived back east then so we did that stuff. Hope you have a great weekend & you get back to "normalcy" soon. Great photos. That boy's going to be taller than Mom pretty soon. hey I hope everything is ok. I don't have your regular e-mail so I commenting here cause it won't let me message you on my space either. If ya need anything even if its just to hide away for a little my dad is still gone. just get ahold of me. Wow! I can't imagine trying to see all that in one day! Sounds like you had a good time.